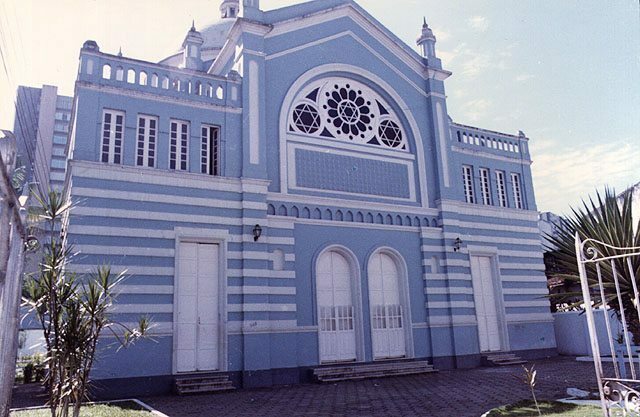 “Shaar Hashamaim” in Hebrew, “Porta do Ceu” in Portuguese or “Gate of Heaven” in English is the name of the first synagogue established by the Sephardi Jews who had immigrated from Morocco to Brazil in the 19th century. 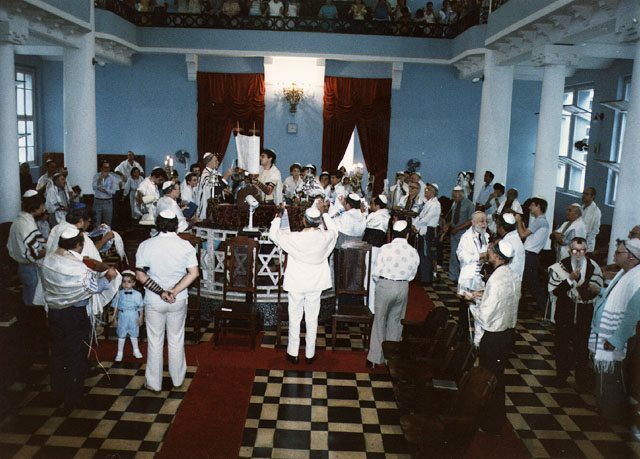 The blue and white two storied structure was built in Colonial style in 1824 by Judah Eliezer Levy. The impressive and monumental facade has three Stars of David in its front, and four main entrances which lead to the main prayer hall and the women’s galleries. At the centre, the elevated and round Bimah is carved in marble with Stars of David. At the east side are seven steps that lead to the Shrine. On each side of the hall, blue painted walls and white plaster columns support the women’s galleries above. The whole structure is surmounted by a big dome. The synagogue is still in use today.